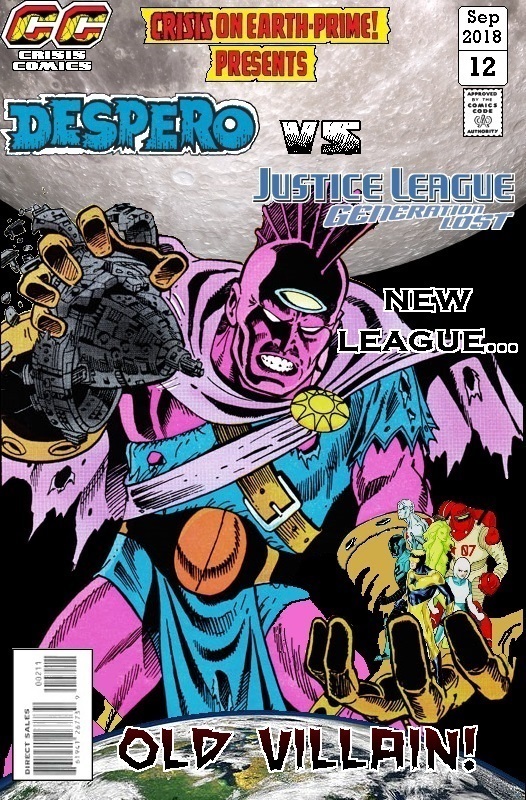 Despero was always one of my favourite JLA villains, espeically after he went through the transformation that turned him into the musclebound rage monster. Him attacking the JLA wearing the United Nations flag as a cape is a heck of an image. Here, though, he makes do with the short lived Generation Lost version of the team. Posted on Monday, September 24, 2018 Monday, October 15, 2018 by GaryPosted in Mash-UpTagged Blue Beetle (Jaime Reyes), Booster Gold, Captain Atom, Despero, Fire, Ice, Rocket Red. Not bad, not bad at all Gary. Yeah I like Naked-except-for-the-UN-Cape he wears-while strangling J’onn. Damn efficient cover in conveying what a badass Despero is. Still is since he last killed Hawkman, even though he’s back now. I will say the JL image is so small they look like 8-bit GIFs in his hand, ha ha. Haha! Yeah – although shrinking them down to fit did mean it hid my hand-drawn reconstruction of Rocket Red’s left arm!